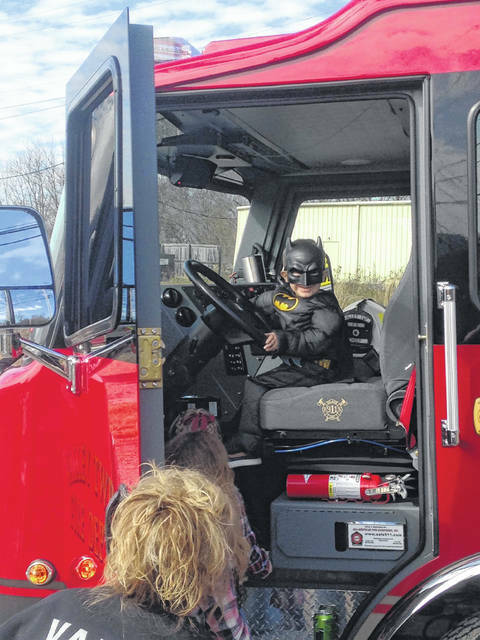 Jase Copas dressed in his Batman costume sounding the sirens on the Valley Township Fire Deparment’s truck. The Batmobile driven by John Buckland on Sunday afternoon to provide Hope Injections to two local youth. Passengers Drayden Sprague and Jase Copas ready for their ride with Batman. 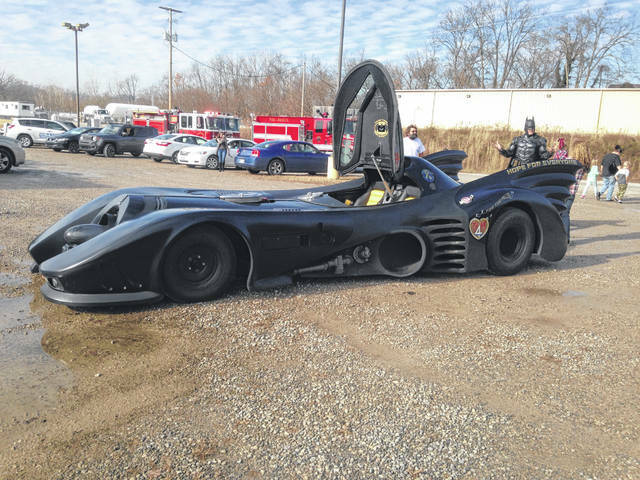 You may have noticed a super hero or two in Lucasville on Sunday afternoon riding around in none other than a long black Batmobile. John Buckland standing over six foot tall complete in costume as Batman met with two kids who cancer has effected in very different ways. Jase Copas, a three year old boy from our area who has been battling leukemia since January, stood by his side, coming in under three foot tall, mimicking the taller hero in his own Batman costume. “One of the cancer foundations sent the Batman costume to Jase in the fall,” said Tracy Brianna Riffe, grandmother of Copas. She said they send costumes to kids throughout the year, who are fighting cancer. “They asked who his favorite character was and of course, it is Batman,” she said. 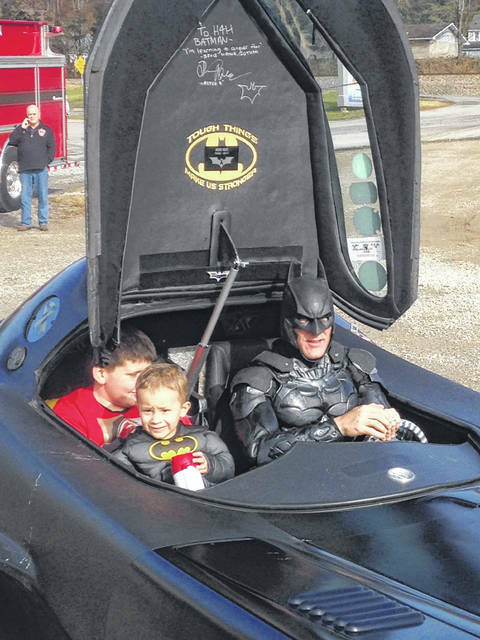 Valley Township and Minford Fire Departments met Batman (Buckland) on US 23 driving the Batmobile North on US 23, and escorted Batman (John Buckland) to the Welcome Home Fellowship parking lot on the southside of Lucasville. This is where Buckland met with Jase and another young man, Drayden Spraguem a nine year old boy who recently lost his father, Eddie Sprague, to cancer in September. Batman’s visit was to bring Hope Injections to the young boys. By riding in the Batmobile, it gives hope for healing. Buckland thought this visit was extra special because he had the opportunity to introduce Jase and Drayden to one another. Two different kids, fighting two different things, finding one thing in common which is a need for hope. Little Copas bounced from the Batmobile to the fire trucks, where he enjoyed sounding the sirens throughout the afternoon. He playfully ran between the vehicles full of smiles and seemed to be living life to the fullest in the fall sun. The Batmobile has a rolling memorial located under the hood that is tribute to 28 kids who have been laid to rest that have been served by Heroes for Higher (H4H). According to its mission statement, H4H is an outreach program teaching kids four points to take them to a “Higher” level. Buckland said. “I came home from Iraq as a fireman and God woke me up at 2:30 in the morning, September 4, 2012 and told me to be Batman.” He said it has been full-time since he started over six years ago. “It just goes to show God will give you the craziest ideas, but if you run with those ideas they will be the greatest thing,” he stated. The Hope for Healing foundation evolved from Heroes 4 Higher according to their website h4hcharity.org. They bring “Hope 4 Healing” to families and communities in crisis. They are available to visit schools, libraries, churches and community events bringing inspiration to overcome drugs, bullying, suicide, abuse and illness. There are four divisions of outreach offered by H4H which are bereavement, hospital/charity, at risk youth and community/crisis response. For more information on the many services offered or to donate to the 501C3 foundation you can visit www.h4hcharity.org or mail donations to H4H Foundation, Inc – 130 Camelot Drive, Huntington, WV 25701 or call (304) 972-2311.
https://www.portsmouth-dailytimes.com/wp-content/uploads/sites/28/2018/11/web1_batman.jpgJase Copas dressed in his Batman costume sounding the sirens on the Valley Township Fire Deparment’s truck. https://www.portsmouth-dailytimes.com/wp-content/uploads/sites/28/2018/11/web1_Batman1.jpgThe Batmobile driven by John Buckland on Sunday afternoon to provide Hope Injections to two local youth. https://www.portsmouth-dailytimes.com/wp-content/uploads/sites/28/2018/11/web1_Batman2.jpgPassengers Drayden Sprague and Jase Copas ready for their ride with Batman.